« Oven Roasted Broccoli – Simply THE Best! If you are in need of a delicious dessert and crave something sweet and chocolatey then you MUST make some chocolate brownie sundaes! It’s a quick and easy dessert that seems like a little celebration in a bowl. You probably have all of the basics in your pantry, fridge and freezer. You may want to purchase a few extra ingredients to have available for when the mood strikes to make this bowl of deliciousness. Your favorite brownie mix and the ingredients to make it. I usually have a Duncan Hines or Ghirardelli mix on hand. I love the mixes with the little fudge packets included. Your favorite vanilla ice cream. We prefer Blue Bell Homemade Vanilla. 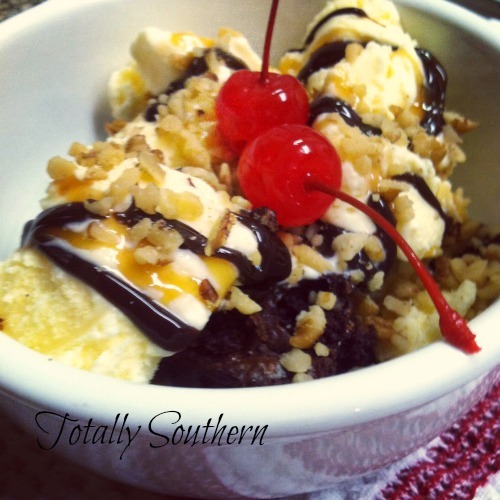 It is so good and creamy and perfect for sundaes. Make your brownie mix according to the package directions. 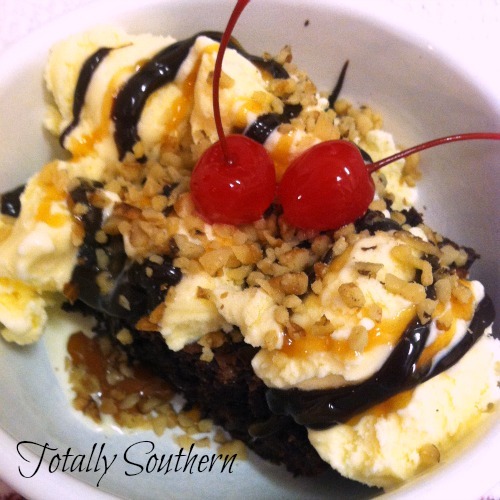 Follow the regular recipe – NOT the “cake-like” recipe for a moist and gooey brownie. Cool brownies, but cut them into squares while still slightly warm. Place a brownie square into a bowl. Top with 3 or 4 scoops of ice cream. Drizzle with warm hot fudge and caramel sauce. Sprinkle on the nut topping. Top with a maraschino cherry or two. Chocolate Brownie + Vanilla Ice Cream = Love! This is one of those desserts that everyone enjoys. 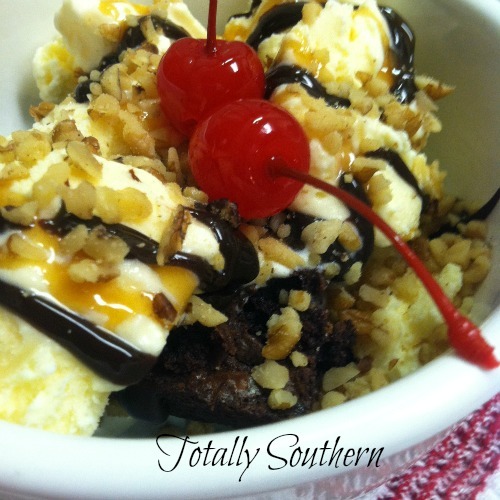 You could make a chocolate brownie sundae bar for a party or celebration. Just place the toppings in cute little bowls or dishes. Use your imagination to add different toppings to the ones listed above. Mini marshmallows, chocolate chips, whipped cream or sprinkles are just a few topping suggestions. Next, place brownies in individual serving bowls and top with scoops of ice cream. Then, let your family or guests help themselves to the toppings of their choice. Fun! If you love chocolate, brownies, and ice cream, then you will love this combination of sweet, salty, chocolate, vanilla, crunchy, warm and cold. It all comes together to make a very special dessert. Please let me know how you like them and what toppings you prefer. Hope your day is absolutely sweet! I will have to make this some time very soon!